Lagos State will be the official Host City of the third edition of The All Africa Music Awards, African Union Commission (AUC) has announced. 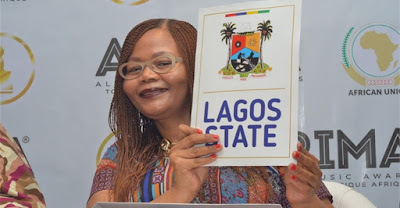 Formally declaring Lagos as the official city to host AFRIMA 2016 edition, the head of culture, African Union Commission, Angela Martins, said that all the cities targeted were equal to the task in terms of infrastructure, tourism potential and richness of culture, but that Lagos State had an edge in key areas. AU had considered four cities (Calabar, Cross River State; Lagos, Lagos State; Port Harcourt, Rivers State and Uyo, Akwa Ibom State) as potential hosts for the continental awards ceremony. According to Martins, the African Union was pushing forward its developmental agenda and policies through the AFRIMA platform. Which celebrates the best talent in the African music industry - which aligns with the vision of the African Union to foster peace, unity and development through cultural expressions and creative enterprise. The third edition of All Africa Music Awards will be held on 4-6 November 2016 in Lagos, Nigeria.